He was so big that just his size would scare people. It wasn’t long before I started calling him my Monster or Monster Merlin. Merlin, Destinie and I would often wake up and have a wonderful good morning howl to start the day. What I would always call our morning song. We would go to bed and howl a nice night-time song as well. The tradition continued when our son was born. He would come into our room and join in on the howling. And that’s just one of the things I’m going to miss most. 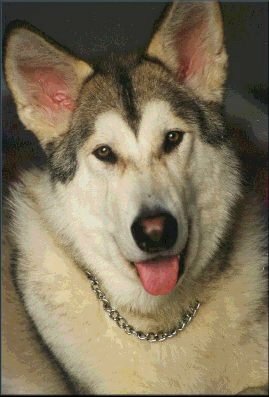 As big as he was, he always thought he was just a little puppy, a lap dog, a snugly little guy who wanted to lay next you or rub up against you like a cat. Only his rub would knock you over. When he wanted your attention he would push his big ole head into the palm of your hand until you scratched his skull. When he wanted something and you didn’t respond fast enough, he’d take his huge paws and grab onto your arm to pull you to what he wanted. Or he’d pull on your arm and accidentally scratch you. He never meant to hurt anyone, he just never realized how big and strong he really was. In 2001 he got lost while I was in California on vacation. He was lost for 7 weeks during the summer and I was heart-broken. I never thought we’d find him. But thanks to the work of my sister Pam, Alexandria Animal Control and the Arlington Police, we finally located him. A cop saw Merlin wander into a gated apartment complex and called animal control. Who alerted Alexandria Animal Control who contacted Pam. We jumped in the car and took off to find him. When we arrived in the parking lot he was sitting under a tree just watching the people coming and going. As I started for him, calling his name, he started to get up and run away. I stopped started howling and asked him if he wanted to come home. 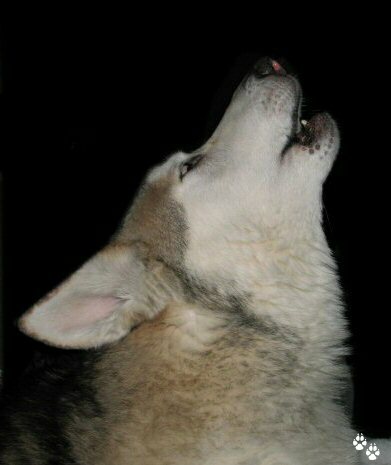 The howl was all we needed to talk to each other and he quickly started for me. The closer he got, the lower to the ground he got. By the time he reached me, he was practically crawling and crawled right into my lap. Which of course knocked me over backwards. While he got out a couple of times at the new house on the lake, he never went very far. That 7 week escapade taught him a lot I think and he never wanted to be far from home again. The day that he, Destinie and I moved into our new house on the lake he was already nervous. He walked through the front door and quickly looked for a way out. He jumped onto the kitchen counter to jump out the window over the kitchen sink. It took a few seconds to grab hold of him and get him calmed down. Once he got a few of the familiar scents of me and Destinie, he started to settle down. Bring in some of our things, and adding our scent to the house helped as well I think. At least I didn’t have to worry about him trying to run out the door while we were bringing things into the house. I think he really loved it here. 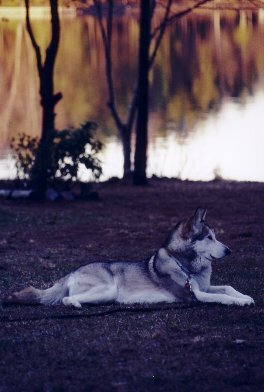 Sitting in the back yard taking in all the smells of nature, the lake and the wild life kept him entertained. And he did enjoy taking a swim in the lake. But after the escape in Northern Virginia, I made sure he stayed here when I went on vacation and the person taking care of him was someone I could trust implicitly! For as big and scary as he was, he really was a wuss. He would much rather sit upstairs in the loft in his own palisade. Looking down into the living room at the comings and goings. Watching any guests who visited with hawk eyes. Or relaxing and gazing through the railings into the back yard and wild life that flew over the lake or swam past our yard. Many times we would let him out in the fall or winter and he would lay in the middle of the yard sniffing the breeze. Even at night beneath the flood lights, he liked relaxing under the stars and cooling off. Unless there was snow on the ground. He was just like a kid excited to get out there and play. He’d bury his nose in the snow and sniff, then come up with a sneeze. He loved rolling in the snow and running around in the cold. 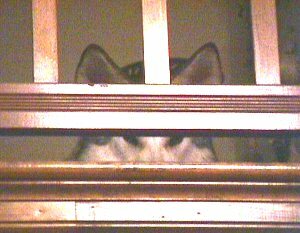 His other favorite place to be was in the corner of the loft looking down into the living room through the railing. His own little cliff to peer out into his world. It was, I think his contented place. When visitors were here, he sat near the top of the stairs. 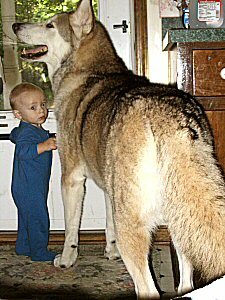 We think it was his way of being in his safe place, but being ready to defend his pack if something happened to us down stairs. Everyone was worried when we brought the baby home from the hospital. Not me. There’s a difference between bringing a Hybrid-Puppy into a home with children and bring a baby into a home with a Hybrid. 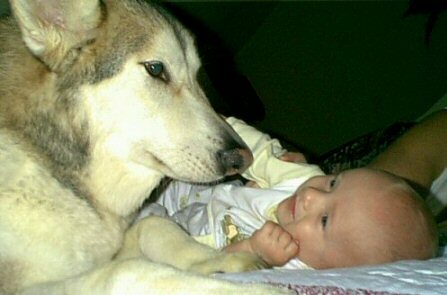 This was his pack family and bringing a baby into his family wasn’t going to be contrary to his wolf nature. But rather the exact opposite. Merlin took to the new baby like jelly to peanut butter. 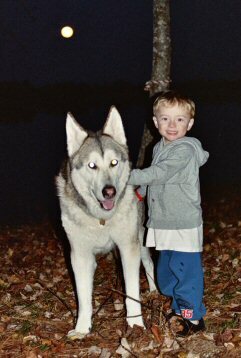 He loved our son just as a member of our pack. When Gary would change the diaper, there was inevitably a bit of crying and screaming…. from the baby that is. Merlin would sit at the end of the bed and growl at Gary, as if to say, you keep hurting my baby and I’m going to beat you up. One day Gary and I had our son on our bed. He was learning how to roll himself over. In the process of playing it came time to change his diaper. I went to drop the diaper into the trash and thought Gary was standing behind me to watch over the baby. Gary was grabbing something from the crib and thought I was next to the bed. Right about the time we both walked back into the bedroom to see the baby about to roll off the side of the bed. But Merlin was there and took his big long nose and pushed the baby back onto the bed. I knew there was no way anyone was going to believe that and we both wished we had video of that moment. But it was one of many moments lost to time. Merlin had his own way of doing things, including many little rituals he had for going to bed. He’d instinctively know when I was coming home from work and would signal Gary to let him outside so he could wait for me. They both knew when it was close to time for me to be home. But while Destinie waited by the door, Merlin wanted outside to see the car come down the driveway. Many times Gary would tell me about the two of them making their way to the front door, or the door to the living room where they could keep an eye on the front door just a few minutes before I would arrive. He and Destinie both had to have their time sleeping on the bed with me at night. Without Gary being there that is. If they didn’t get that time, Merlin would be restless for most of the night. Somehow they both always seemed to know when Friday had rolled around and it was time for Pizza night. They often knew exactly when the pizza guys were coming just before they pulled into the drive way. We knew when to get ready for the delivery, all you had to do watch Merlin and Destinie head for the front door. Merlin was very shy around people. Except when the Pizza guy or girl came. Then it was into the kitchen and for a few of them, he would go right up to them and even let one or two of them pet his head. That was a big deal for Merlin. He has also been immortalized as the logo for SpringWolf Designs. And his image will always be present on the many sites I’ve designed for customers and friends. In April 2007 Merlin was diagnosed with nasal cancer. It was a very emotional road, but we fought this terrible disease as long as possible. I just couldn’t stand to see him deteriorate and Gary and I both knew it was time to let him go. He was such a part of me, I don’t know what I’m going to do without him. I love this big goof so much and he will always be my big baby. It’s so very hard to say good-bye. The day was made worse as we were getting ready to say good-bye to Merlin when my sister called. 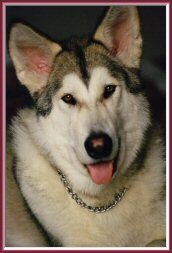 To let us know that her baby Shadow had collapsed that morning and left us on the same day. July 2007 has been a very terrible month for us. We lost Odie, Shadow, and Merlin. All our big babies! I miss Merlin. A lot. I miss that big goof too. I just read your story of Merlin. What a blessing to have had him in your life. He is a beautiful animal and I know his spirit lives on.